Easy running, This is a self-tuning Short Reed Canada Gut. Locating tangs at the back of the soundboard will help in proper placement of the reed and wedge. Makes tuning a breeze. This is especially useful to beginners. This is a molded gut ready to fit a 5/8" bore. Easy running, very fast, very goosey. 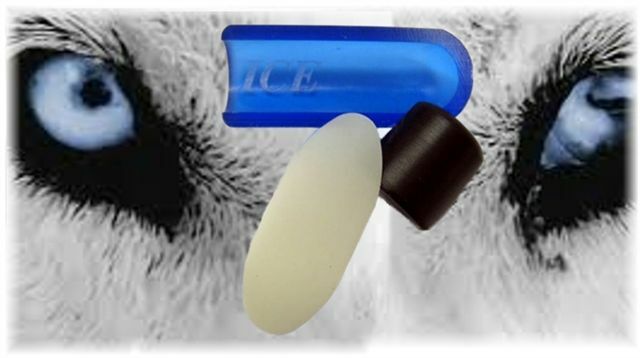 They're adjustable, and made from acetyl plastic one at a time. These are not molded. 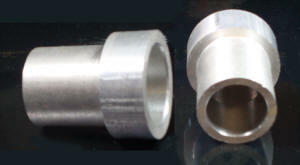 Designed for 5/8" bore. Straight up, pure goose, fast and loud. Made from acetyl plastic one at a time. These are not molded. 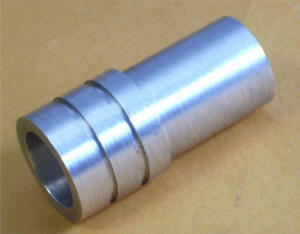 Designed for 5/8" bore. 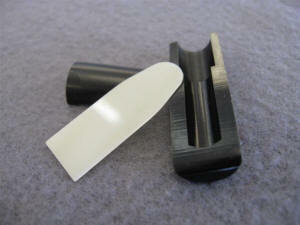 A Short Reed Canada Gut Set Ideal for a shorter insert. 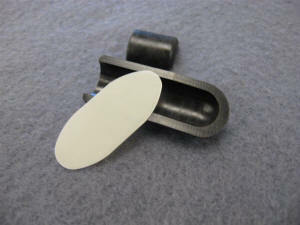 The Gut comes with our new Aluminum wedge that keeps the tennon area perfectly round when the wedge is installed. 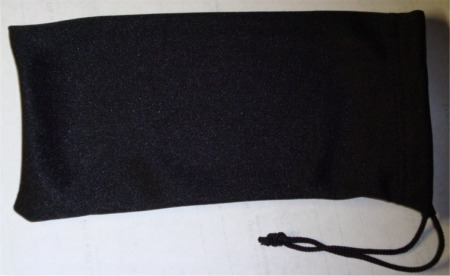 This wedge will help keep the dimple out of the middle of the reed. 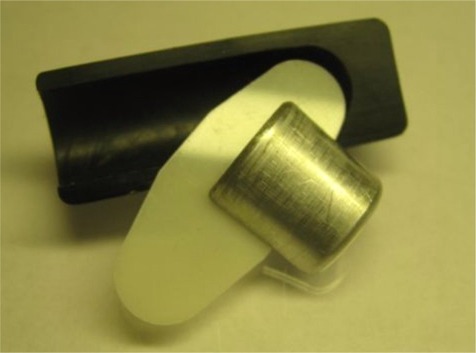 The aluminum wedge also creates outstanding holding ability keeping the guts in place. Comes with a narrower Reed than our other sets. This narrow Reed is extremely fast and drops into the trough deeper. A good low end as well as a very crisp crack can be expected from these guts. Fits 5/8 bore. Made from acrylic one at a time. The higher density that acrylic offers gives these guts a sharper crack. These are not molded. 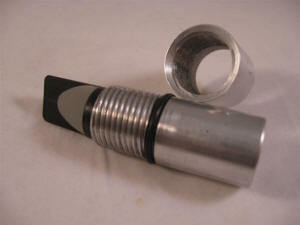 Designed for 5/8" bore. 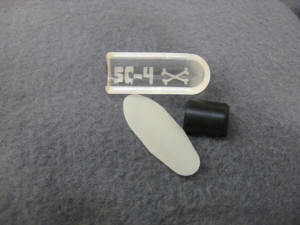 This 1/2 inch gut Is easy to tune and is capable of producing all the ground and flight sounds of a Whitefront Goose. Easy Running And Deadly!!! ICE; A gut born with pure Canada Goose Demise in its intention. This short reed set has very smooth note transition, and is very fast with an incredible sharp crack. The board is machined one at a time from acrylic rod stock. 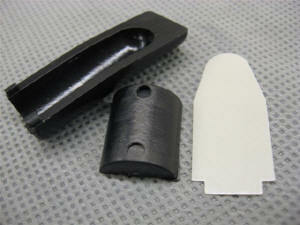 Added is a perfect fit Delrin Wedge. This gut will fit a 5/8" bore. This short reed set has very smooth note transition, and is very fast with an incredibly SHARP crack. 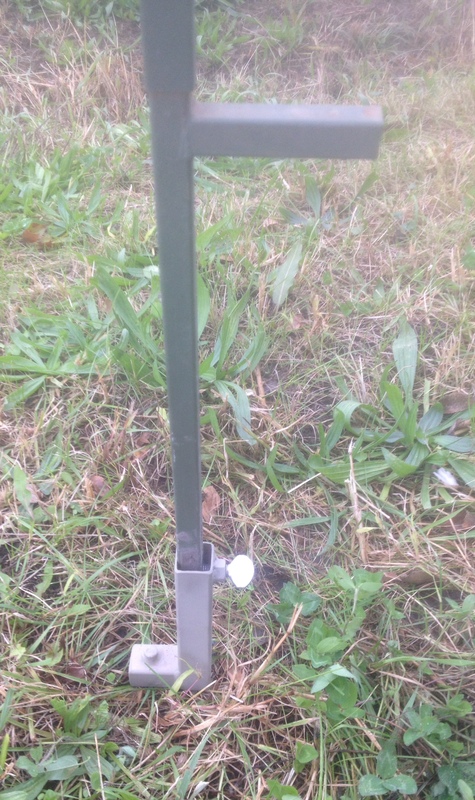 Built the same as our popular ICE Gut, but with a back bore added to the exhaust end of the gut. 14 mil. Type A mylar. NOTE: Fits Original Gut, SC2 Gut, SC4 Gut, and ICE Gut. Install this sleeve in your short reed insert to strengthen the tennon area and protect it from cracks when installing your guts. Uses a 17mm bit to bore into your insert for glue in. 7/8" of glue in surface. .625 bore. Two decorative grooves in the band. 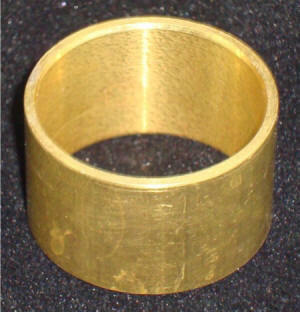 Brass band plated with hematite. Appearance and sheen of nickel with a dark look. 1" outside diameter by 1/4" wide by .045" wall thickness. 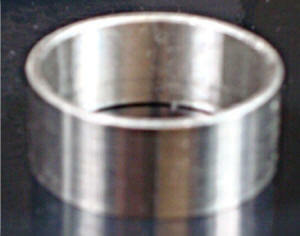 1 1/4" outside diameter by 1/4" wide by .065" wall thickness. 1 1/4" outside diameter by 1/2" wide by .065" wall thickness. 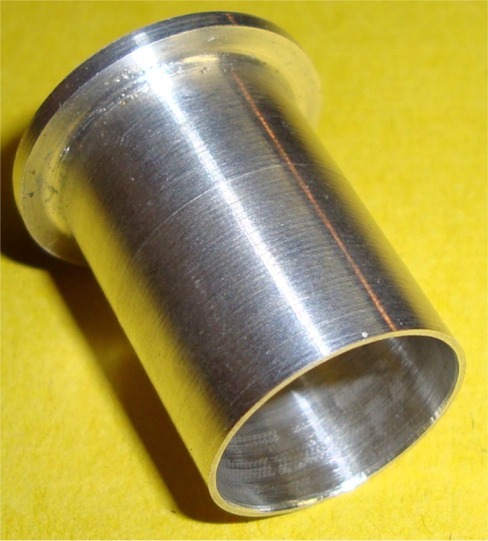 1 1/4" outside diameter by 1/2" wide by .025" wall thickness. 1 1/4" outside diameter by 3/8" wide by .065" wall thickness. 1 1/4" outside diameter 1/2" Wide .065" wall thickness. 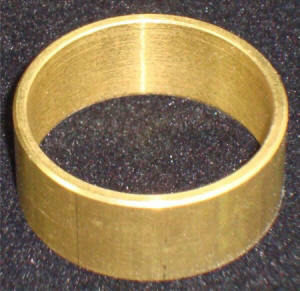 1 1/4" outside diameter by 3/4" wide by .065" wall thickness. 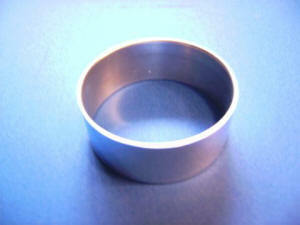 1 1/4" outside diameter 3/8" wide. 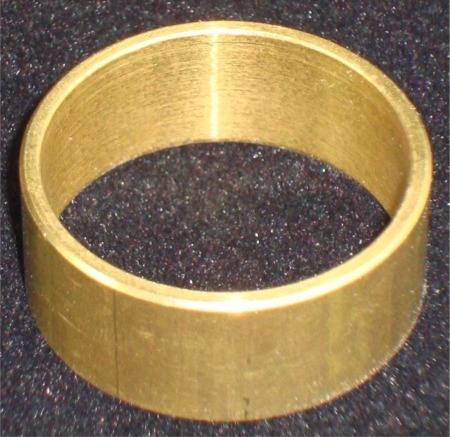 1 1/4" outside diameter 1/2" wide. Size A: .065" Wall Thickness. Size B: .040" Wall Thickness. 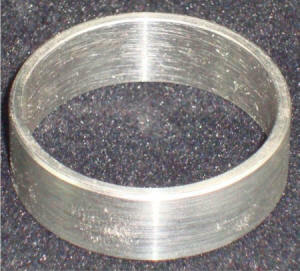 1 1/4" outside diameter 3/4" wide .065" wall thickness. This item glued into your barrel will give you a perfect tennon socket for your short reed goose call. 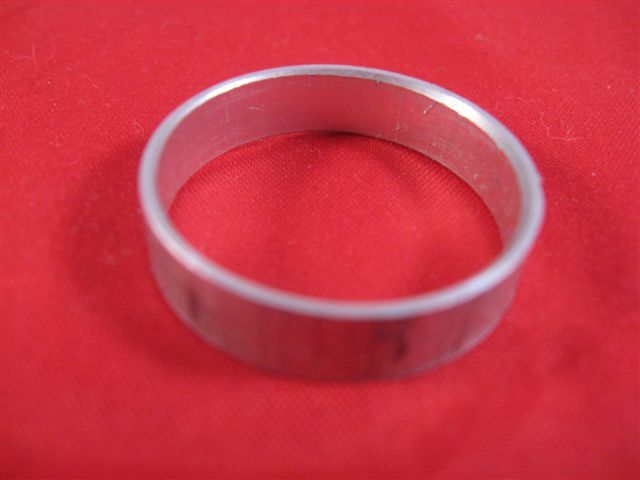 This item, along with the tennon socket, also gives you a 1/2" aluminum band all in one piece. Barrel needs to be drilled 31/32" to accept this piece. Glue in surface lenght is 1". 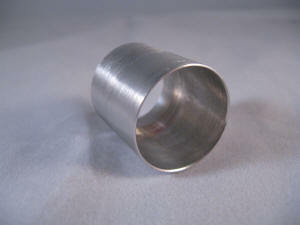 Bore through is 3/4". Tennon Socket depth is 13/16". 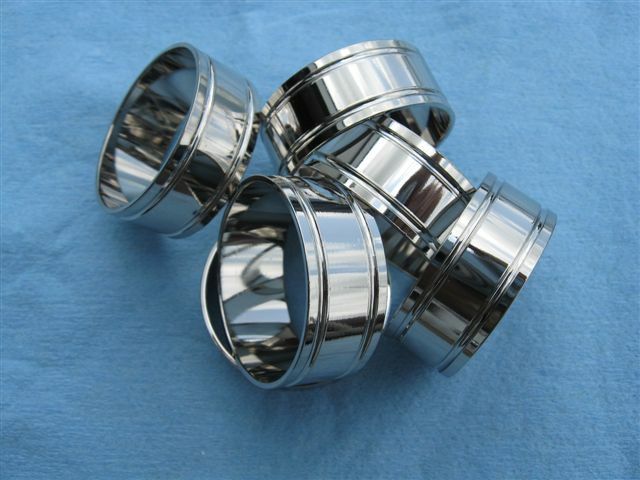 Inside diameter of tennon socket is 7/8". 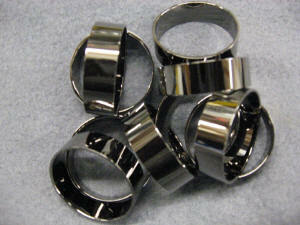 These will work great with our acrylic or aluminum inserts. 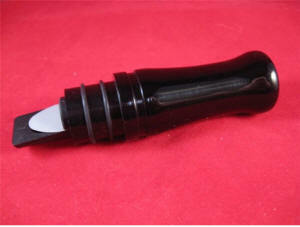 This item glued into your barrel will give you a perfect tennon socket for your short reed goose call. 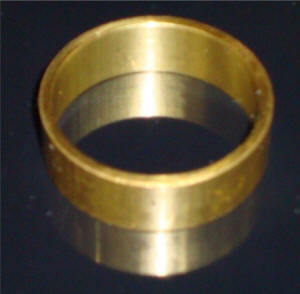 This item repairs the problem of wood barrels tearing O rings on the insert. Barrel needs to be drilled 31/32" to accept this piece. Glue in surface length is 1". 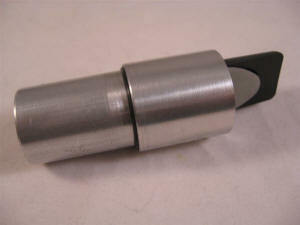 Bore through is 3/4". Tennon Socket depth is 13/16". Inside diameter of tennon socket is 7/8". 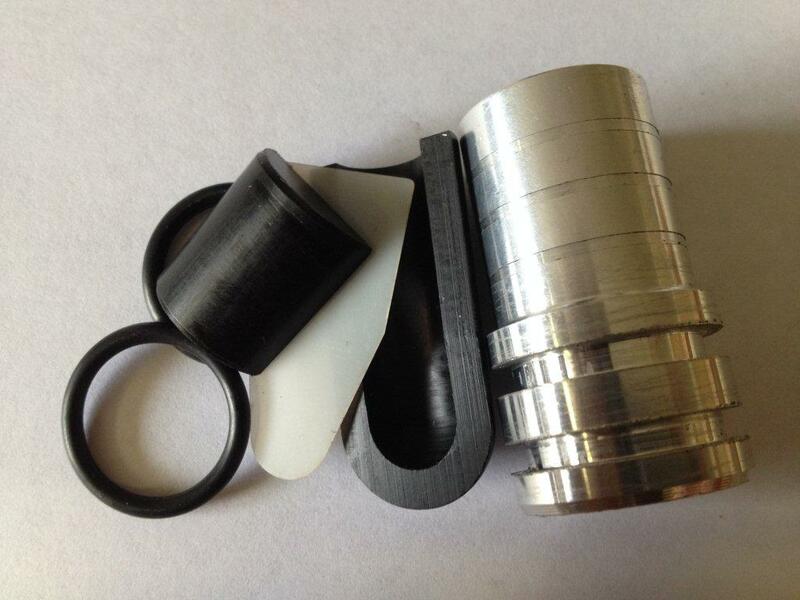 Make installing short reed goose call guts into your wood inserts pain free and attractive! for gluing into your insert. 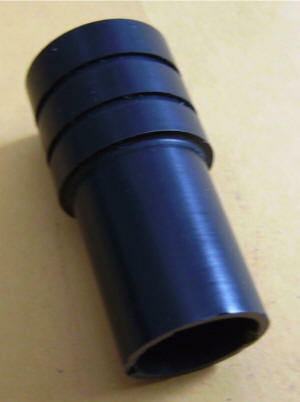 Tennon is designed to fit a 3/4" bore in the barrel. 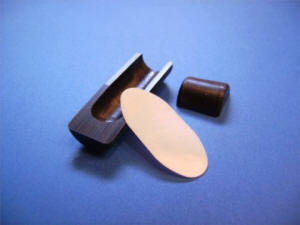 Glue in surface is 5/8" Diameter by 1" long. Comes pre-tuned with a full reed and a set of our own Shell Creek Game Calls guts. A proven length with great sound. Add your own barrel to complete the call. 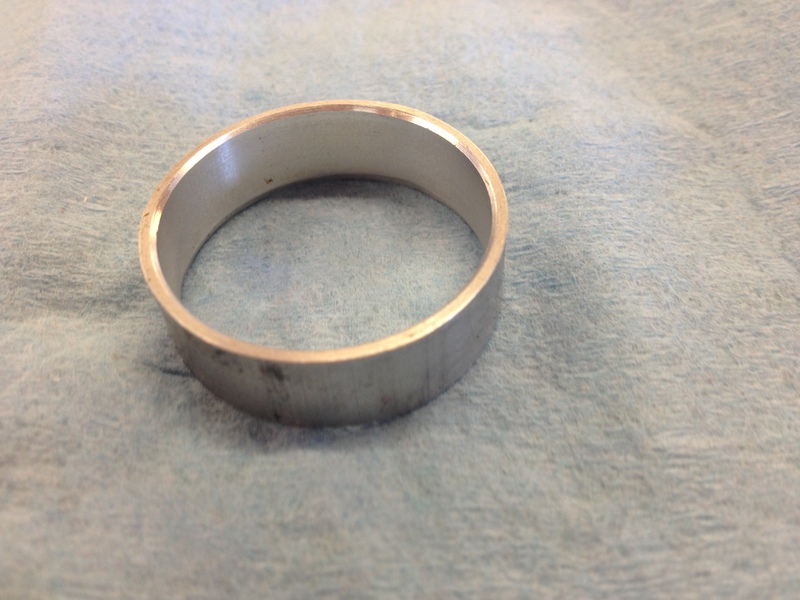 3/4" bore required in barrel to accept O Ring tennon. 7/8" bore required in barrel to accept O Ring tennon. (Shown with guts installed.) Glues into the barrel and the insert. Threads assemble the two parts of your call together. 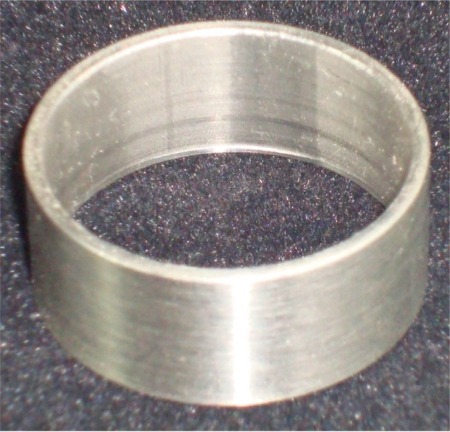 An O-ring is there to complete the seal Between the two parts. 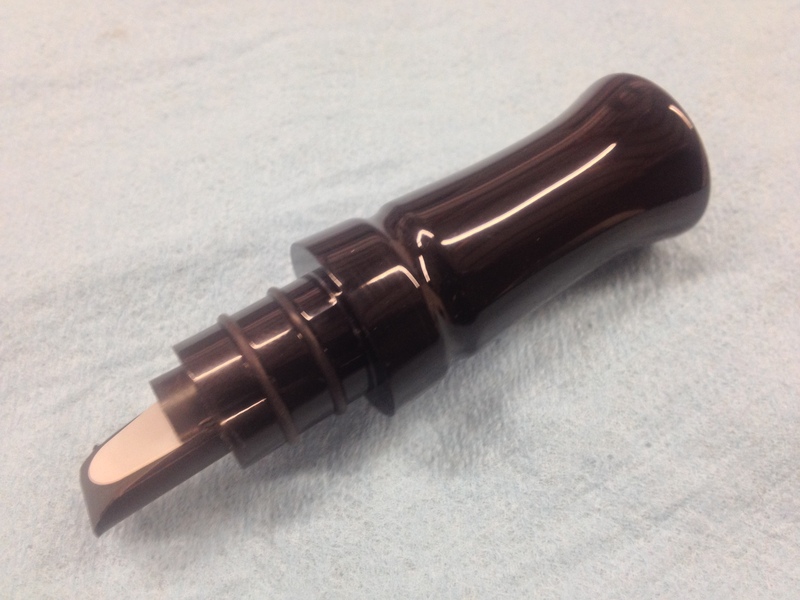 The BOLT Designed By Bill Rombach of Shell Creek Game Calls years ago is making a new apperance better than ever. These are the best they can be. 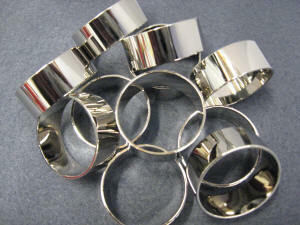 Shiny Nickel will give you the smoothest possible thread while never sticking like other metals can do. This part is going to add flash to your beautiful calls with the same great function it is intended for. 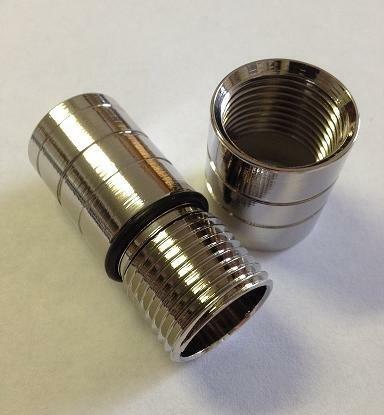 This Bolt is a step up from our original popular Aluminum Version. If you have never used these or know what they are. These two parts Glue into the barrel and the insert. Threads assemble the two parts of your call together. An O-ring is there to complete the seal Between the two parts. This product is the same as the popular Aluminum bolt above with the same dimensions however nickel plated.